When i was browsing the net, i found this website, which i think you should pay a visit. 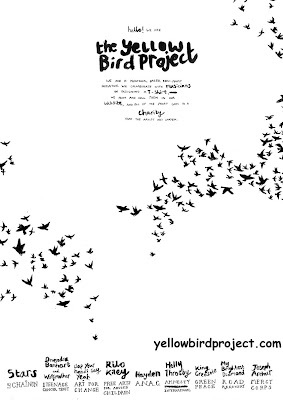 Yellow Bird Project is a nonprofit organization that raise money for charity through the collaboration with indie band and musician, like the Dears, Elvis Perkins, The National, Hayden, Au Revoir Simone, etc. 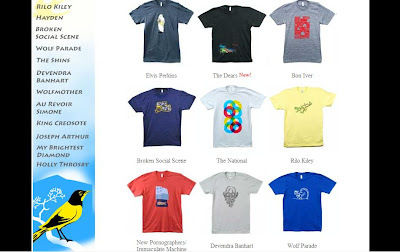 There are various different t-shirt designed by each band that you can buy to help the nonprofit organization that the band is trying to help. 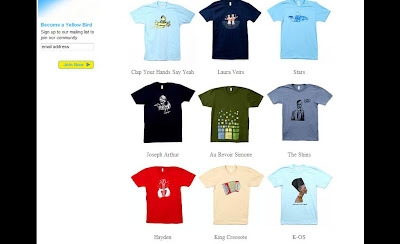 So, you can determine which organization you are going to help and pick your t-shirt design. The nonprofit organization includes , The Acoustic Neuroma Association of Canada. , Pablove Foundation, Le Chaînon, ALS Society of BC. etc. The t-shirt has the unisex, woman, or man size and the price range is about US$25 - ish. This activity show how music, art, and fashion can be used as the media to help others in need. Today's not the era where your creativity and ability is kept for yourself alone. this is a completely brilliant idea, and i had never heard of it before your post! radical. i am ging to get to it! checked the site and they've got some cool designs! great great project and initiative.thankyou for telling me about it. do mind to follow my blog? Thanks for sharing. Cool bands + helping the community = awesome.